An absolute beauty, but it comes with a hefty price tag. Excellent tone and response; possibly the best solid-state amp we've heard yet. It's particularly expensive, even though you do get plenty for your money. Steadfastly solid-state, Roland's Blues Cube series of amplifiers have been around since the 1990s and they're popular with players looking for a reliable and portable alternative to valves. The range is now being taken upmarket and relaunched with new technologies that threaten to reduce the difference between valves and solid-state to the point where it no longer matters. Based on extensive R&D, Roland's new Tube Logic design philosophy claims to recreate the same smooth overdrive and touch-sensitive dynamics of a good valve amp. In addition, most of the new Blues Cubes are compatible with an expanding range of Tone Capsules. Developed with top-flight artists including Robben Ford, Eric Johnson, Kirk Fletcher and Oz Noy, these modules are plug-in circuit modifiers that reshape the Blues Cube's tone and response for more specific needs. Here, we're looking at the Blues Cube Artist 2x12 combo and the Robben Ford and Ultimate Blues Tone Capsules. 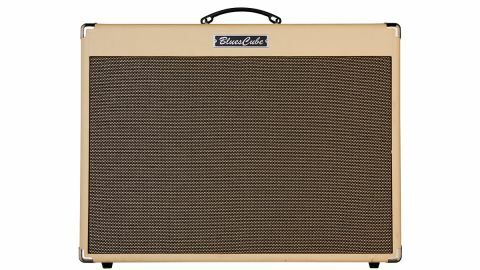 As 2x12 combos go, the Blues Cube Artist is a good-looking box, with pleasing proportions, smart blonde vinyl and a salt 'n' pepper grille cloth concealing a pair of Roland-badged custom design V80 12-inch loudspeakers. The Cube is lighter than a similar all-valve product, although it's still quite sizeable, so a pair of side-mounted grab handles would make it much easier to lug around. This is as close as you can come to valves, without valves... The natural touch-sensitive response breathes just like a good valve amp. Its electronics are a mix of surface-mount and miniature components on a robust PCB that contains everything, including all the front panel controls, which use vintage-style Roland knobs. The standard of wiring and soldering is good, and it all looks tough enough to handle life on the road. The Artist is a proper two-channel design with clean and crunch options that can be used independently or both at the same time. Next to a pair of high- and low-gain guitar inputs, there are a couple of push- button switches for channel selection (if a footswitch isn't in use), followed by the clean channel volume control and the crunch channel gain and volume controls. Both channels have a pair of switches called Tone and Boost. Boost is pretty self-explanatory, while the Tone switches lift the treble and mids, similar to a bright switch. There's a shared set of conventional passive tone controls, followed by level controls for the tremolo and reverb effects, with a couple of push-button switches to set the tremolo speed and switch the effects loop in or out. the power amp controls: a presence knob, a master volume and an output power switch with four options of 0.5-watt, 15 watts, 45 watts and Max, so you can achieve authentic output-stage clip effects at practically any volume. On the Artist's rear panel, we have jack sockets for regular latching footswitches, or the GA-FC controller. You also get a headphones socket, a line-out and a pair of send/return jacks for the series effects loop, together with a useful USB recording output. Underneath the chassis is the Tone Capsule receptacle, which takes one of an expanding range of artist-approved plug-ins that reshape the amp's gain and tone structure for a more tightly defined response. Overall, the Artist has a pleasing 'retro- modern' vibe and a purposeful feel that inspires confidence, even before we plug in. The Artist switches on without drama. In addition to the red power LED, there's another red 'running light' on the PCB, visible through some ventilation slots. The amp's medium-gain, high-impedance FET preamp gives a guitar room to breathe, with an open, dynamic clean sound that can be pushed forward or reined back in the mix with the Tone button, which lifts upper mids and highs. Engaging the Boost function thickens up the tone and adds a gentle touch-sensitive drive effect. Turning up the channel volume controls adds more drive, as the Artist emulates the power amp cut-off and transformer saturation effects you'd hear if you did the same thing to a valve amp. This can be tuned to suit any volume using the power level switch. The Crunch channel, as we'd expect, has more drive and more mid-emphasis, with a nice bite as you dig in. It's very similar to a 50s tweed Bassman, which is hardly surprising as that's what the Blues Cube's Tube Logic R&D was inspired by. What is really surprising, though, is that with a little careful tweaking of the power level and channel volume, you can pretty much nail the Bassman's response, which allows you to drive the amp from your fingers: back off and it cleans up nicely; dig in and it begins to snarl; dig in a lot and it has the same aggressive bite as the real thing. This naturally expressive tone is helped by the loudspeakers, which are custom-made for the Artist and really shift the air. It's also assisted by the cabinet - Roland has tapped into a boutique secret and used poplar plywood for the enclosure. The Tone Capsules are the Artist's 'secret sauce' - they modify the amp's response and tone to a more specific, tightly defined range. Poplar ply (sometimes known as furniture ply) is around two-thirds of the weight of birch hardwood ply and is very resonant, which makes it ideal for use in a guitar cabinet. It's also more stable and less likely to shrink. Several top boutique builders use poplar ply in their amps and it's interesting that Roland has picked up on this, too. The Tone Capsules are the Artist's 'secret sauce' - they modify the amp's response and tone to a more specific, tightly defined range. Built in a 12AX7-sized package with a familiar nine-pin base, the Tone Capsules plug into a ceramic valve socket underneath the chassis. When the amp is switched on after installation, the Tone Capsules light up in different colours and the mains and internal LEDs change colour to match. A nice touch. The Robben Ford capsule glows blue, increases clarity and softens the Blues Cube's tweed bite to come closer to the smooth, violin-like drive Ford is known for. Lit up in green, the Ultimate Blues capsule was developed with the great American blues artist Kirk Fletcher and is intended to provide more of a small amp 6V6 feel, which it does very well, with increased compression, sag and a buttery midrange when played clean. We have to say, this Tube Logic-powered Blues Cube is pretty much as close as you can get to valves, without valves. It's not so much the tones, which are great, but the natural touch-sensitive response, which breathes just like a good valve amp. The plug-in module idea isn't new, but Roland's approach here adds a lot of versatility - albeit at a price. Pitched into the boutique market and aimed at pros and well-heeled amateurs, the new Blues Cube range is far from cheap: you could buy a very good valve amp for similar money to this. However, the Blues Cube Artist can provide the same great tone consistently night after night and you'll never need to replace anything - because unlike real 12AX7s, the Tone Capsules don't wear out. But the proof is in the playing. After about 10 minutes with the Blues Cube, we forgot about what was generating the sounds and just enjoyed it. Whatever the technology, surely that's the sign of a good amp? Try one and tell us what you think.